I'm a tall lass. I've had a lifetime of slightly lowering my head to hear what less tall people are saying. I've lifted no end of products off high up supermarket shelves for little old ladies and I've banged my head on far too many unexpected wooden beams in houses with low ceilings built by and for my vertically challenged ancestors than can possibly be healthy. When I first heard about the singer from Sweden called The Tallest Man on Earth I got a bit excited that he might actually be THE Tallest Man On Earth. I consulted his website but couldn't find a clear answer. I searched around on the interweb for more information about who actually holds this title and found out there's a guy from a small village in Ukraine called LEONID STADNIK who is 8ft4 (bet he gets lots of little old ladies asking for help). It quickly became apparent that The Tallest Man on Earth is not THE Tallest Man On Earth but a guy called Kristian Matsson with a clever marketing plan to catch out simpletons like me (it worked Kristian). Slightly disappointed I wrote an email to his MySpace message box asking him just how tall he is, I'm still awaiting a reply. Anyway even if The Tallest Man on Earth isn't actually THE Tallest Man on Earth he has still been gifted with an amazing voice along with an incredibly photogenic face and has just recorded a Take Away Show in the Music Inn in Greenwich Village, New York. The Music Inn shop is crammed full of amazing musical instruments, all the different colours of wood make a fantastic backdrop creating a warm looking musical haven. The Tallest Man on Earth looks content in there, I would be too and I could probably reach most of the instruments hanging off the ceiling. Enjoy these shows and I'd recommend watching this YouTube video called It will Follow the Rain, one of my favourites. He's already playing The End Of The Road festival in the UK in September but hopefully he'll add a few more UK dates, I really want to hear this guy play live. Tallest Man on Earth - The Gardener - A Take Away Show from La Blogotheque on Vimeo. 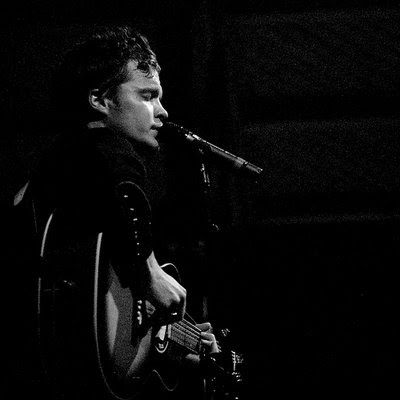 Tallest man on earth - These Days (Nico Cover) - A Take Away Show from La Blogotheque on Vimeo. Great post! I love the Take Away Show series and his voice sounds so raw... i like it. a lot.